74 • June 2018 • S I G N & D I G I T A L G R A P H I C S Product Review C O N T I N U E D Archetectural Lighting Strip Orgatech Lighting, Orange, California, introduces AC LEDStrip — an extremely flexible, energy efficient, high-lumen, linear LED lighting system for indoor or outdoor use. Operating directly on ordinary 120 line voltage, AC LEDStrip can be used in runs up to 150 feet without the use of LED drivers or additional power sources. AC LEDStrip is well suited for a wide-range of interior/exterior hospitality, commercial/institutional, retail merchandising; as well as for upmarket indoor and outdoor residential applications. AC LEDStrip can be easily concealed in and along ceilings and walls; coves, building, and room interiors; around baseboards and ceiling moldings; in staircases, along railings and columns. For information, visit orgatech.com. 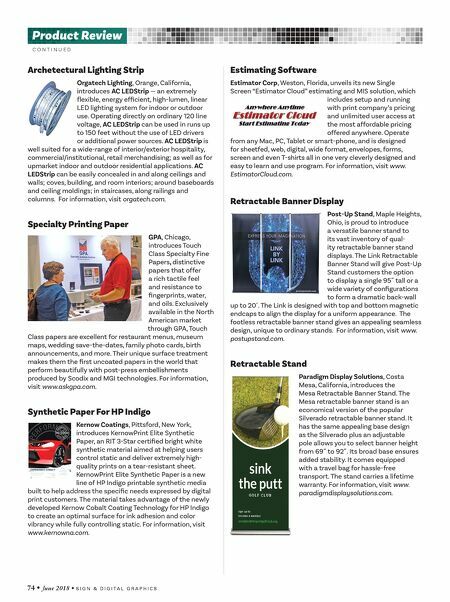 Specialty Printing Paper GPA, Chicago, introduces Touch Class Specialty Fine Papers, distinctive papers that offer a rich tactile feel and resistance to fingerprints, water, and oils. Exclusively available in the North American market through GPA, Touch Class papers are excellent for restaurant menus, museum maps, wedding save-the-dates, family photo cards, birth announcements, and more. Their unique surface treatment makes them the first uncoated papers in the world that perform beautifully with post-press embellishments produced by Scodix and MGI technologies. For information, visit www.askgpa.com. Synthetic Paper For HP Indigo Kernow Coatings, Pittsford, New York, introduces KernowPrint Elite Synthetic Paper, an RIT 3-Star certified bright white synthetic material aimed at helping users control static and deliver extremely high- quality prints on a tear-resistant sheet. KernowPrint Elite Synthetic Paper is a new line of HP Indigo printable synthetic media built to help address the specific needs expressed by digital print customers. The material takes advantage of the newly developed Kernow Cobalt Coating Technology for HP Indigo to create an optimal surface for ink adhesion and color vibrancy while fully controlling static. For information, visit www.kernowna.com. Estimating Software Estimator Corp, Weston, Florida, unveils its new Single Screen "Estimator Cloud" estimating and MIS solution, which includes setup and running with print company's pricing and unlimited user access at the most affordable pricing offered anywhere. Operate from any Mac, PC, Tablet or smart-phone, and is designed for sheetfed, web, digital, wide format, envelopes, forms, screen and even T-shirts all in one very cleverly designed and easy to learn and use program. For information, visit www. EstimatorCloud.com. Retractable Banner Display Post-Up Stand, Maple Heights, Ohio, is proud to introduce a versatile banner stand to its vast inventory of qual- ity retractable banner stand displays. The Link Retractable Banner Stand will give Post-Up Stand customers the option to display a single 95˝ tall or a wide variety of configurations to form a dramatic back-wall up to 20´. The Link is designed with top and bottom magnetic endcaps to align the display for a uniform appearance. The footless retractable banner stand gives an appealing seamless design, unique to ordinary stands. For information, visit www. postupstand.com. 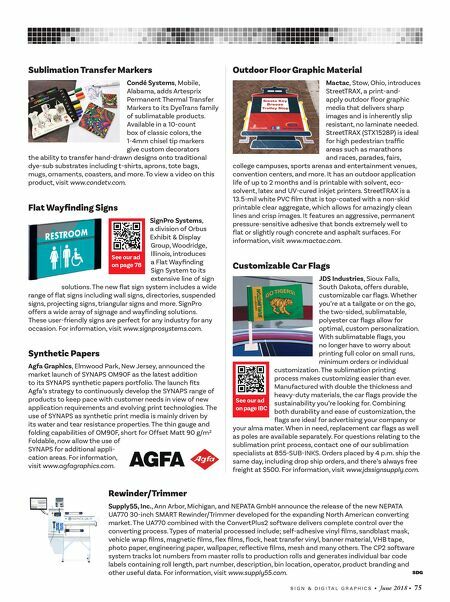 Retractable Stand Paradigm Display Solutions, Costa Mesa, California, introduces the Mesa Retractable Banner Stand. The Mesa retractable banner stand is an economical version of the popular Silverado retractable banner stand. It has the same appealing base design as the Silverado plus an adjustable pole allows you to select banner height from 69˝ to 92˝. Its broad base ensures added stability. It comes equipped with a travel bag for hassle-free transport. The stand carries a lifetime warranty. For information, visit www. paradigmdisplaysolutions.com.